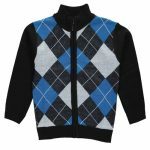 We’ve combed our selection to compile a list of sweaters that are sure to spread cheer wherever your little trendsetter may wear them. 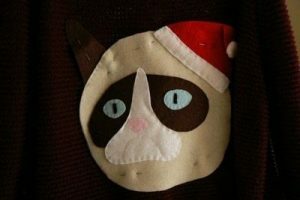 Further below, you’ll find some tips for creating your own ugly sweater for an ugly sweater party. Happy sweater season! Seafaring clothing is enjoying a moment. 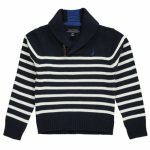 Check out this striped Nautica sweater with shawl collar. Nothing says preppy like a classic argyle print. This American Legend sweater features an easy zipper closure. 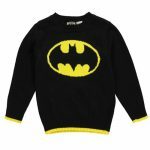 Give your Batman or Batgirl the iconic style of this character-inspired sweater! 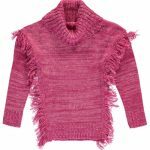 This year’s fashion runways were full of fringed embellishments and turtleneck styles like this Dollhouse sweater. Ponchos and capes have reemerged onto the fashion-scene. Layer your little fashionista’s look with this Pink Angel poncho. What about baby? 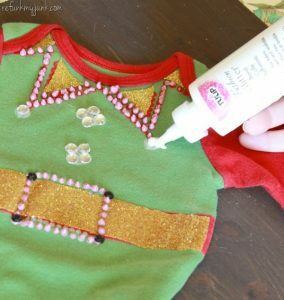 This enterprising mom uses a long-sleeved bodysuit and fabric paint for this adorable look. Re-purpose Dad’s ugly ties with fabric glue and tape. 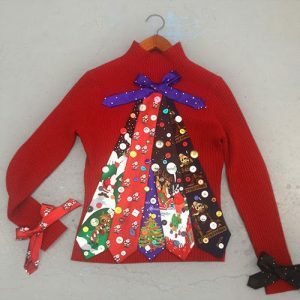 For the seamstress in your family, cut and sew your own shapes. 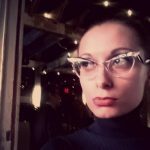 Seneca A. Iscove is a blogger and frequent contributor to CookiesKids.com. Born and raised in NYC, she affiliates with other fairies and Jedi on the never-ending quest to find the perfect time to write. A mass media enthusiast and truth seeker, Seneca admits that she likes cookies-but prefers birthday cake!